I had my annual company-provided health checkup recently and finally received the English-language results recently (the results first came in hieroglyphic Korean). Most everything was just fine and dandy, except that my total cholesterol was a touch high again this year. Last year my father, the physician named "Dr. Harris", told me that I needed to bring my cholesterol down, and I completely ignored him. "Things are happening to your body right now whether you acknowledge them or not," he warned. As I already get a reasonable amount of exercise (mostly from very early mornings at the gym), I saw my food consumption as something which I need to tackle. In Korea, salad can be an anytime food! I have never been a dieter. I'm generally conscious of staying away from fast food, sweets, binge eating, excessive amounts of carbs and all that. But though my diet is generally based around trying to eat more fruits and vegetables (and, hence, less of the bad stuff) I have never been strict about it. Nor have I needed to be. Since coming home one summer from college to have my mom calling me "chunky", I have never carried more than a couple excess kilograms. Since moving to Korea, my weight has stayed lower than when I lived in the US. And there is a reason for that: portion sizes at restaurants are smaller here, and I walk a lot more nowadays ... I have not owned a car for over 2 years. So, protein shakes from the gym are out -- I don't know what is in those. Milk too -- unnecessary calories and fat. Out with cholesterol-heavy egg yolks. More fish-eating in the Samsung cafeteria and less pizza, pasta, fried pork cutlet... oh those things are so delicious though! And, I decided to try logging my foods last week into the Samsung S-Health application built into my new Samsung Galaxy S5 phone. Monday morning rolled around, and as usual I headed straight off the long bus ride from Seoul to Samsung Digital City in Suwon, darting towards the basement cafeteria in the Mobile R&D building. This cafeteria is quite new and most foreigners in Suwon like it for the ample variety of foods -- not everything is Korean food! 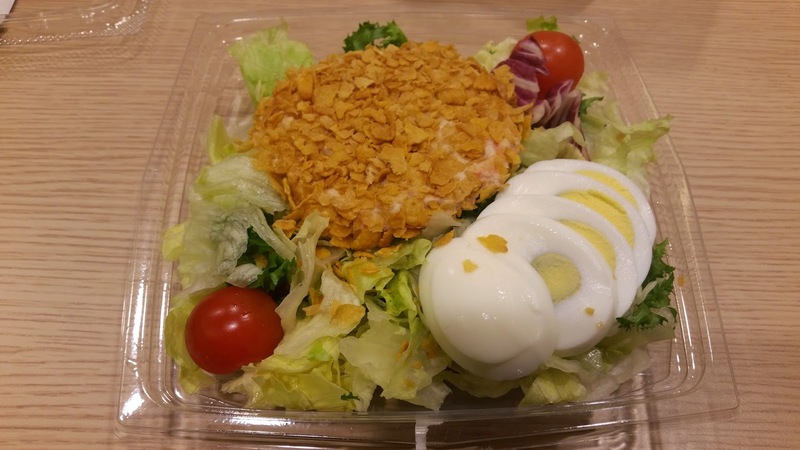 I grabbed my usual morning salad, something I never considered a breakfast food until I moved to Korea, where I have learned that salad could be an anytime food. I sat down with my plastic tray, whipped out the phone, and here I went. Cherry tomatoes...uh oh, "Set Portion Size". My choices are cups, grams, and calories. Now I have no idea how many calories are in cherry tomatoes, and I struggle with the metric system, so cups... how many are 3 cherry tomatoes? 0.3 cups?? Sounded good to me! Sweet potato, maybe 0.5 cup? Rotini, grated parmesan cheese, lettuce, radishes, 2 cooked egg whites. I was already tired of this experiment! 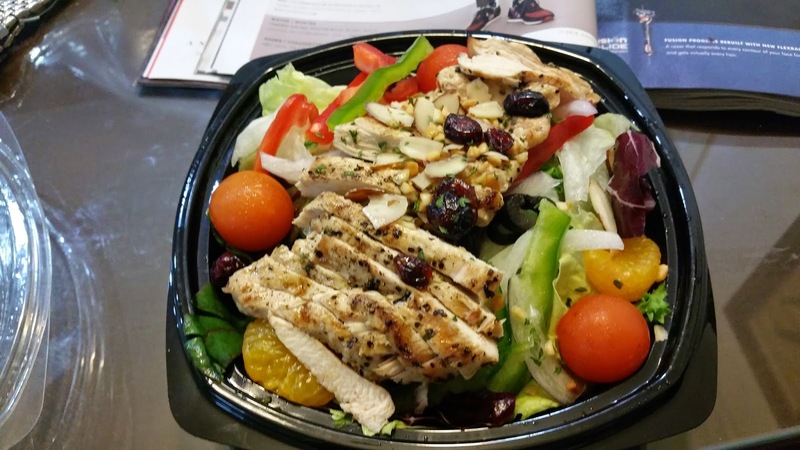 The app counted 326 calories...no salad dressing helped keep that number down. Next, lunch in the Samsung cafeteria. 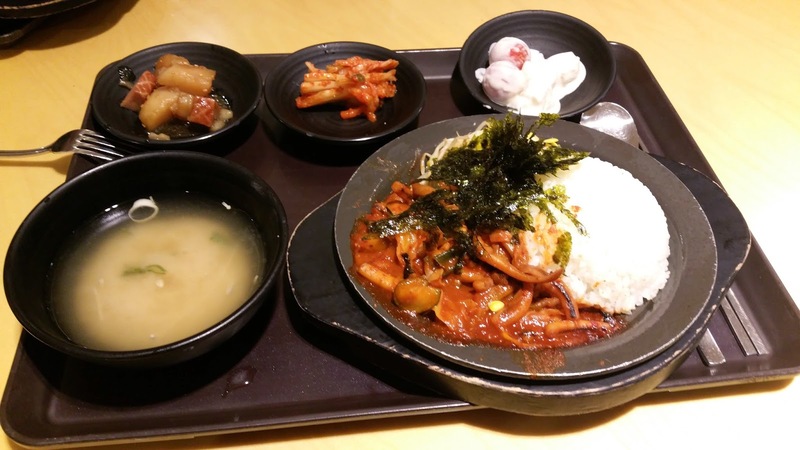 For better or worse, I typically eat 2-3 meals per day in the Samsung cafeteria in Suwon. There are several reasons for this: I am not a great cook (and a lazy one at that), the food is convenient, it generally seems healthy (if I make the right food choices), it is dirt cheap (heavily subsidized by the company). And let's face it, I now commute at least 50 minutes each way to work now, and if I'm working late then eating at Samsung cafeteria is my only antidote from preventing starvation. With my newfound dedication to seafood, I went for spicy boiled squid. And again, whipped out the app at the lunch table. This time, I used the photo-taking option in the app to document my food, but this doesn't enter any information into the app. So, manually plugging away... boiled squid, white rice, bean sprouts, dried seaweed, cherry tomatoes, pineapple chunks, kimchi, honey-baked ham, potatoes, miso soup, red pepper paste. I had no idea how to classify the white sauce covering the fruits. Though the menu board outside the cafeteria helpfully posts the estimated calorie values for each meal (most are 800-900 calories), I still found entering the portion sizes difficult and tedious. I eat a lot of snacks at my desk during the day, and now I needed to input those too! 2 americanos, 30 almonds, 4 tangerines (in season now), some of my colleague's bagged popcorn, 3 mini-bananas, a red pepper. For dinner, I skipped the cafeteria, and ordered a takeout salmon salad from Greenbasket, a gem of a little salad restaurant between the bus stop and home in Seoul. Again, I tediously estimated portion sizes and avoided the salad dressing. Still starving after the salad, I chugged a few glasses of water and ate 60 grams of cashew nuts (don't remember *how* I calculated that). For Day One: 2,508 calories. And to think of how many calories I burned trying to enter my foods into the S-Health app! I was hungry and tired of dieting already. Breakfast: salad topped with tuna croquette. Lunch: Spicy tuna stew, with a side of tofu, kimchi, seaweed, and purple rice. Turns out that purple rice is just white rice stained with a sprinkling of black rice. The things you learn when tracking your diet! (S-Health, of course, did not have an entry for "purple rice"). Snack: Mini Bananas, Carrots, Tangerines. I cheated when my coworkers started handing out chocolate and crackers in the afternoon, as well as a couple of the Honey Butter potato chips which Koreans are obsessing over at the moment (no idea why). Dinner: Again went to Greenbasket (thank God for that place!). Salad topped with grilled chicken, again skipped the delicious dressing, again starving afterwards. 4th meal: Starving, so I ate cashew nuts and a cup of yogurt. 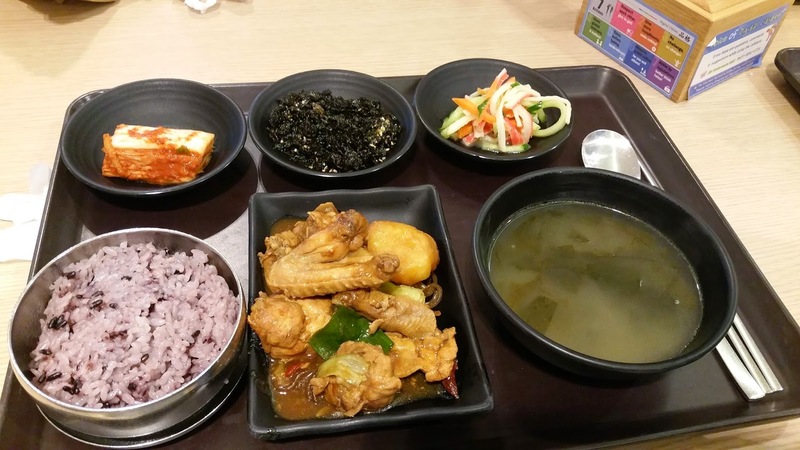 Dinner: This time I made it a full 3-meal day at Samsung cafeteria! Tofu with rice, mushrooms, seaweed, zucchini, radishes. Side of chicken sausage. Lunch: Today we had a team lunch at a local steak and pasta restaurant near the Digital City. Per Korean custom, we shared a lot of small dishes which provided delicious variety, but made it hellish to record. Especially having the phone on the table the whole meal led to some teasing from my teammates. Besides steak and linguine, fruit & nut bread, olive oil, lettuce + cherry tomatoes, roasted potato, portabella mushrooms, truffle balls and brownies for dessert. 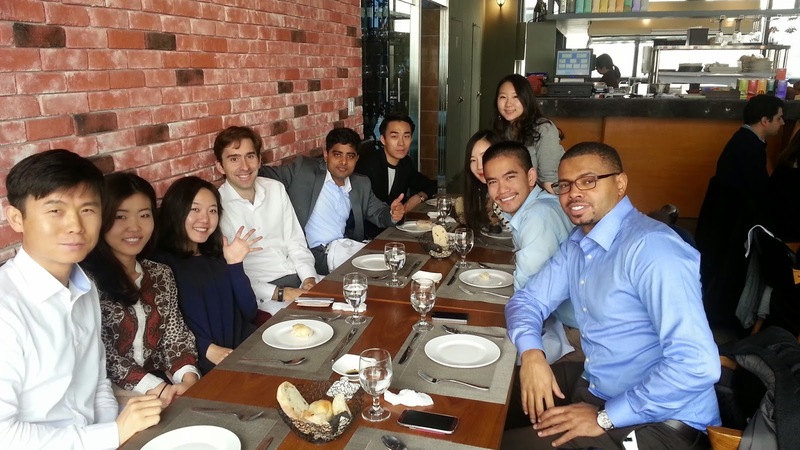 Dinner: Another meal out, this time with alums of the Darden business school living in Seoul. We met at a Mexican food restaurant, and again shared dishes family-style. To not be completely obnoxious, I did not keep my phone on the table and I worked hard to mentally record everything going into my mouth: chicken burrito, chips with guacamole, french fries, fried calamari, 1 porter beer. Snacks: The usual + a slice of banana cake (with icing) I received when we celebrated my colleague's birthday. Lunch: A Korean style chicken dish, jin-mee tong-dak (진미통닭). Seaweed soup, crabmeat mixed with carrots ad cucumbers, seaweed, cabbage, and the purple rice. Snacks: The usual fruits/vegetables plus a chocolate chip cookie gifted to me by a teammate. Dinner: I ran into one of my colleagues as we were dropped off the Samsung shuttle bus in my neighborhood and followed him to a sushi restaurant. As you can imagine, sushi restaurant completely defeated S-Health. Being able to identify every type of fish and side dish while eating in a foreign country is almost impossible. Plus I was so tired of obnoxiously logging everything that I again tried to mentally record everything, but the sake inhibited my memory substantially (and sake has a lot of calories, who knew!). So, as you can see, actually tracking what you eat is an exhaustive, and exhausting process. S-Health was difficult to use: though you can take pictures of what you eat the app does not do you any favors by identifying the foods you are eating from the pictures. Units are sometimes unconventional and can be difficult to estimate when you are not preparing everything yourself -- even then you would need to measure all the portion sizes quite closely. The app seems built for the American customer as it lacked even Korean foods, and I also could not enter the names of niche Korean vegetables in the Korean language. This lack of Korean support is strange because so many parts of my phone only speak to me in Korean jibberish. In summary, diet tracking was every bit as painful as you can imagine. 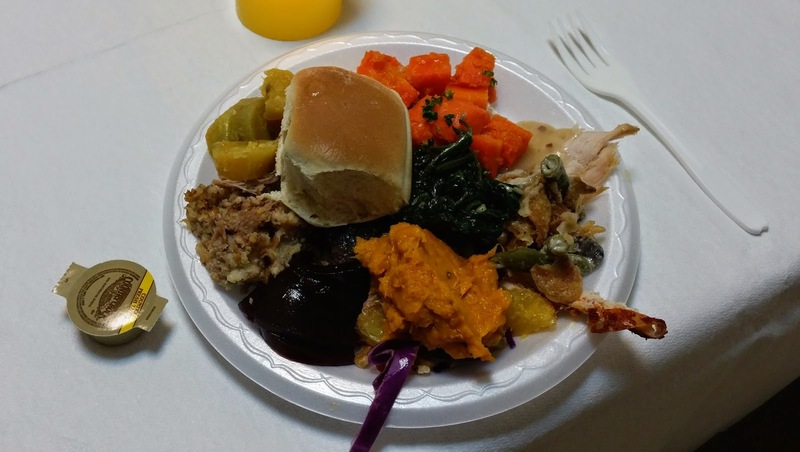 Last Saturday I celebrated American Thanksgiving with my friends, and per American custom I gorged on the feast of foods we had available (my friends are quite excellent chefs). No calorie counting, of course!! At the end of the meal, I lay down, satisfied with my gluttony and my complete annihilation of all the fastidious diet tracking. 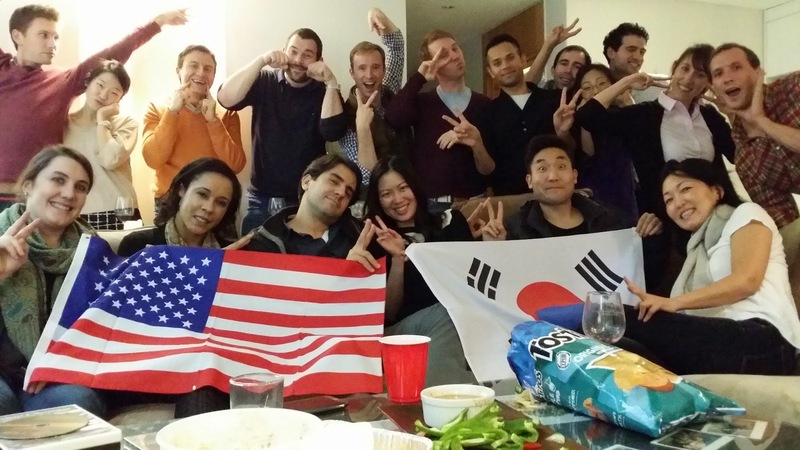 The American Thanksgiving party... strike a funny pose!